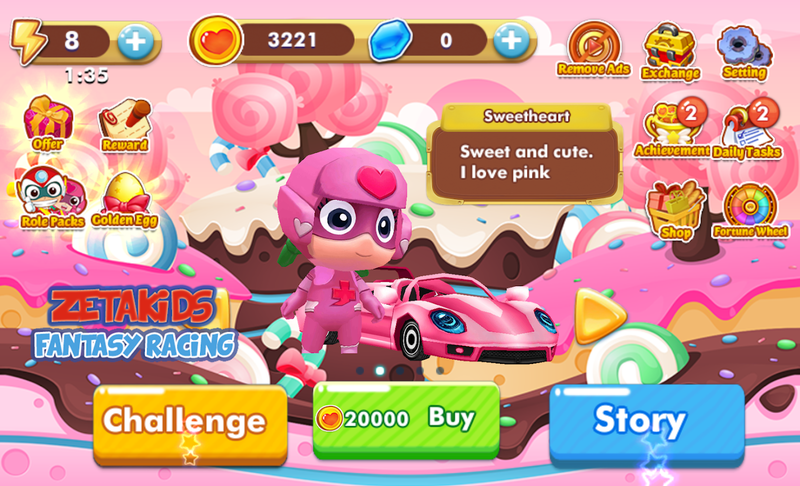 Zetakids is fantasy racing adventure game , this journey fromharleyand friends to save his planet. Available story andchallenge modethat you can play in this game, on story mode whenyou alreadyfinish on first line then you can continue to nextstage world. Becareful there also available boss on stage , he hadmany power todefeat your journey. Collect coins and bonus on yourjourney. Thereavailable many power that you can use on the way.Can you helpharley to finish his mission? Lets do it. Road racing is street racing style game , its journey aroundtheworld you will face best racer accross the land, you mustdefeatall of them to continue mission. This is available racingmenu : -Quick race - Career mode - Multiplayer mode - Event modeThats allyou can choose to start your journey. Available more than32+ carsin garage also can be upgrade. Collect as many coin andcash topurchase new car. Lets start the journey and become racinglegend. Happy farm saga - is modern farm game that combine harvest,productand selling on farm simulator game. In this game you willplay manytask from beginning day , finish all mission and task tocontinuenext level. You can play as farmer , manager or staff onthe shopand achieve your big success. To play this game you mustfollow anyinstruction that available on any level , sometime thereyou mustfinish on available time, you must achieve on revenue, etc.Collectdaily login bonus diamond , also available weekly bonusdiamond forfree , gotta catch it. Lets start build empire business. Father and Son is an adventure that takes off from the NationalArchaeological Museum in Naples, a cultural institution housingsome of humanity’s greatest artefacts and treasures.What begins asthe story of a son who never knew his father becomes a universaland ageless tale, with the present and the past making up thesetting for Michael’s travels. Seek for yourself the beauties ofNaples, experience the last hours of life in Pompeii before MountVesuvius erupted in 79 AD, and explore the ordinary day-to-day lifein Ancient Egypt. The past is what makes our present real.Completion time: 50-60 minutes. Some sections of Father and Son areunlocked by checking in at the Archaeological Museum of Naples,publisher of the game. The Father and Son soundtrack is availablefor download on the official site. The airship to the Saint Heaven is about to set sail, shining withglorious memories. Warrior, it’s time to get back to the adventure!Dragon Nest Mobile is here! Dragon Nest M is a 3D action adventureMMORPG containing 100% of the classic features, 3D non-targetingbattles, authentic images, unforgettable stories and unpredictablenew challenges! Cerberus, Manticore, Dragon Nest…all the classicbosses are back! As a powerfulhero of Altera, you must fight evildragonsand save the world. Download it now and tell your oldfriends to join you in Dragon Nest M! ======GAME FEATURES======▶THE CLASSIC NEVER DIES Transplanted from PC game, Dragon Nest Mbringsthe classic dungeons back. Chasing destiny girl Rose, thedeath of Gerrant, legend of the 6 heroes...you can venture into thefamiliar storylineand fantasy world once again! ▶STUNNING VISUALSExcellent 3D graphics and special anime effectswill immerse you inbreathtaking battlefields. Powered by the Unity3D Engine, DragonNest M pushes the boundaries of what’s graphically possible.▶THRILLING REAL-TIME COMBAT The unique non-targeting combat andunlimited combos make it easy and fast to control. Hack and Slash!Experience all the nonstop action and incredible combat in the palmof your hand! ▶6 CLASSES TO CHOOSE FROM Choose your favorite classfrom Warrior, Archer, Mage, Tinkerer, Cleric and Assassin. Morethan 70 skills to pick, you can always find a new set of combo!▶WIDE VARIETY OF GAMEPLAY Explore instance Dungeons,fight in PvPbattles, slaughter the dragons, expand your collection, trainmonsters, and more! Team up with your friends and challenge thestrongest Bosses! ▶MASS-SCALE PVP BATTLE Face your opponent withadjusted attributes, and feel free to challenge anyone in the game.Crush theenemies with your epicskills, daze them with your ultimatecombos.Only the strongest can survive! ▶CUSTOMIZE YOUR CHARACTERCreate your unique dream look! It all depends on you. Hundreds ofexquisite fashions, fancywings and awesomemounts…carefully matchyour character from head to toe! ▶RISE TO THE TOP IN GUILDSAssemble or join a mighty Guild with hundreds of players, strivetowards common goals. Fight along with your Guild members, unitedas one, the spoils of war will be yours! Come back to Dragon Nestwith your friends, save the Continent of Altera once again!Onward,Warrior! Victory is yours! More exciting contents and gameplays arewaiting for you to be discovered! Please note: an internetconnection is required to access the game. I Monster is a best Roguelike RPG. You can play as a little monsterto start an exciting adventure. Fight against evil human. Savemonster friends from the prison of human. Collect powerful relicsand learn strong magic. One day you will become the best monsterand reveal the scheme of the evil man. It perfectly mixedcollecting, exploring, adventure, strategy, fighting, developingand stage passing. All of these efforts are made for better RPGgame experience. Features: ●Roguelike Game--Random maps in alladventures. Have new experience every times. ●Various CharacterFigures--Create the monster you like. Show your personality.●Plenty Equipment--Collect gears, inlay gems. Let yourself reachthe highest power. ●Special Skill System--Double-helix skill treeallows you select skills you like. ●Deliberate Boss--Mysterious andpowerful boss is waiting for your challenge. Contact with us:Facebook: https://www.facebook.com/imonsters/ Youtube:https://www.youtube.com/channel/UC9yl_ZQbVMorB_NxGYmRtkA/featuredBest Roguelike offilne game, train,collect monsters fightingagainst evil human.. Discover the new and addicting bubble shooter game! Take part inthe legendary adventure, go to war against the colorful bubbles todefend your empire and win the fight. Try it out today and getready for a clash in the epic shooting battle! Popping bubbles wasnever so exciting! Play the action bubble pop game Bubble EmpireChampions, work on your strategy, practice your balloon matchingskills, and get ready to become the war hero! Join the bubblesempires game, conquer hundreds of challenging levels and winpoints. Hit the target, blast and pop all the colorful balls andclear the board. Get it now for FREE and enjoy the most fun shootergame. You can play this bubbles game anywhere and anytime you’dlike - no wifi and no internet required to become the puzzlefighter champion league. Why You’ll Like this Bubble Shooter Game? * Play hundreds of addicting game levels, packed with funchampionship puzzles. * Explore the empire kingdom bubble shootinglegend, and enjoy the classic smooth gameplay. * Complete puzzlequests and collect awesome rewards. * Reach the epic game leveltarget and win. * Fight alongside the bravest warriors of thekingdom and conquer all the amazing challenges. * Boost yourexperience with awesome power-ups and boosters and pop all thecolorful balloons. * Shoot and explode 7 blaster balls in a row tounlock the FIREBALL that will burn every bubble on the way. * Drop10+ bubbles at once to get a BOMB that will take out surroundingbubbles. * See which color you are getting next and work out astrategy to smash all bubbles using fewer shots. * Less moves youpass a level, the higher score you'll get. * Overcome thechallenges and break all the bubbles to win boosters and power-ups. * Play offline! Aim, Hit the Target and Pop Bubbles! Solve puzzlesin this fun bubble shooter and enjoy hundreds of addictive levelsfilled with fun and intriguing challenges. Come up with killergaming tactics and win coins! Bubble Empire Champions is a relaxingfree game, perfect for families and friends to play and have agreat time. Don’t miss out this epic legend! Are you ready tobegin? Warm up your fingers and prepare for the great blast gamebattle. Join the hero adventure and blast your way to victory. Ifyou love online puzzle games and can’t get enough of exciting brainteasers, this app is simply perfect for you. Conquer the empire ofbubbles and win big! All rights of Bubble Shooter ™ are owned byIlyon Dynamics Ltd.
Walkr encourages you to walk more while also exploring theboundless galaxy! －The galaxy adventure game is combined with apedometer! －Thanks for the support of 500,000 android players.－Record daily walking steps automatically, explore the charminggalaxy and reach your fitness goals. One small step for you. Onelight-year for Walkr! Hop abroad the fantastic Walkr spaceship andstart your adventure across the boundless cosmos. On a rocket builtby an 11-year-old genius, you'll use your ""walking energy"" tofuel the ship, allowing you to discover more than 50 fascinatingplanets, like Caramel Apple, Octopus Cavern, Heart of Flames, andmore! Throughout the universe, you'll also encounter delightfullost space creatures who will need your help along the way. It'struly the adventure you've been waiting for! Walkr is the secondfantastic offering in a series of health-conscious games fromFourdesire, creators of Plant Nanny, a fun sim which reminds usersto drink water daily, and already has more than 500,000 androidplayers! = FEATURES = －FREE TO PLAY －Build your own galaxy anddevise new ways to increase the population in it －Explore theever-expanding, boundless universe －Undertake missions to helpadorable creatures across the galaxy find their homes = GET SOCIAL= －Visit and say hello to your friends’ galaxies －Bridge yourfriends and accumulate your energy faster －Jump in an epic, join afleet, and start an adventure with other captains －Show off your40+ awesome achievements, the earnings will make you super proud!"